The Revolutionary court in Baharestan (Tehran) have heavily sentenced four Turk civil rights activists to jail and exile in Aprin 2017. These activists are well-known for their activities in defending the cultural rights of Turks in Iran especially the right to educate in mother language. 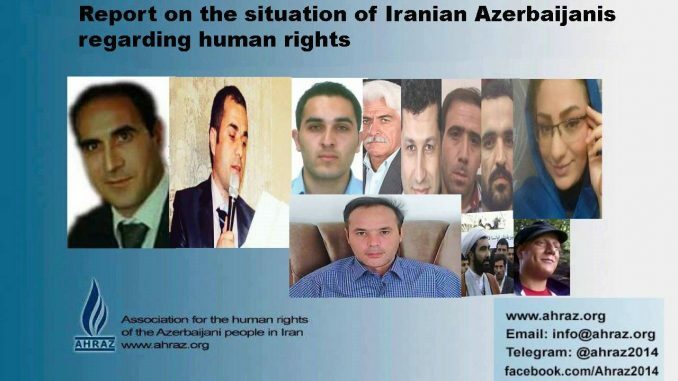 According to AHRAZ (Association for the Human Rights of the Azerbaijani people in Iran), they all had been arrested in the ceremony of international mother language day that had been held on February 21, 2015 in Nasim Shahr in Tehran province. Before being released on bail, all have been interrogated in detention ward of Evin prison in Tehran for months. The accusation, which is mentioned in the sentence, are ““forming an illegal group with the aim of disrupting the national security”. According to the sentence, Mr. Akbar Azad, journalist and researcher, has been sentenced to 10 years in prison and two years of exile to the town of Darreh-Shahr. Mr. Alireza Farshi, the expelled professor of international university of Jolfa, has been sentenced to 15 years in prison and two years of exile to the town of Baghmalek, southwest Iran. However, five years of this fifteen years is related the accusation of establishment of a campaign on mother language education in 2014. Mr. Hamid Manafi nazarlou, Turk civil rights activist, has been sentenced to 10 years in prison and two years of exile to the town of Azna, west Iran. Mr. Behnam Sheykhi, Turk civil right activist, has been sentenced to 10 years in prison and two years of exile to the town of Masjed Soleyman, southwest Iran. As evidence to prove his charge, the sentence has just considered that Mr. Mirzaee have “Belief to establish a federal system” and struggle for “free elections based on the international standards”. In addition, it has mentioned that “he defends the right of education in mother language for all oppressed nationalities in Iran and having books and articles in ethnic studies in his library”, which have been considered as “destructive and actions against the Islamic Republic of Iran” according to the text of the sentence. Mr. Mirzaee has been arrested at his workplace in Tehran, was transferred to ward 209 of Evin prison on July 14, 2016, and is kept at Evin prison ever since. Mr. Habib Sasanian, poet and Turk civil rights activist in Iran, has been arrested on May 15, 2016 and after an interrogation period jailed in Tabriz prison so far. According to AHRAZ (Association for the Human Rights of the Azerbaijani people in Iran), Mr. Sasanian was kept in prison in an undecided condition for almost one year without assigning a court for his case, however he has recently been summoned to The 3rd branch of The Revolutionary Court in Tabriz. During his detention in Tabriz prison, he has been suffering from various illnesses and been deprived of regular medical treatment. To protest against this condition, aside his family’s demonstrations in front of Tabriz Judiciary, Mr. Sasanian went on hunger strike in April 2017. Mr. Sasanian was arrested along with Mehdi Javadzadeh, Hamid Saghafi, Babak Avand, Esmaeil Afkhami and Younes Rahimi. Among them Mr. Rahimi has been exonerated and the rest have been released on bail after interrogation waiting for the trial. After the arrest, the head of judiciary of East Azerbaijan province called these six people members of the espionage group of Gamu in June. Turk civil and women rights activist, was sentenced to 5 years in prison in April 2017. Mrs. Soheila Kargar, Turk civil and women rights activist, was sentenced to 5 years in prison in April 2017. According to AHRAZ (Association for the Human Rights of the Azerbaijani people in Iran), the Revolutionary Court of Qazvin (branch one) has convicted Mrs. Kargar of alleged charge of “membership in the group to disrupt public security”, however it was not addressed any “group” in the sentence. The only evidence, which has been considered for this accusation, were the activities of Mrs. Kargar on her own channel on Telegram (the social network popular in Iran) in connection with her election campaign in 2016. Mrs. Kargar was the candidate for Iranian parliamentary election in Qazvin, but was disqualified by Supervising Council of parliament. Mrs. Soheila Kargar was arrested at her home by the security forces violently on May 15, 2016. After four days, her family could get information that she was transferred to Evin prison for interrogation. On June 2016, Soheila Kargar was released from Qazvin prison on the bail of 500 million IRR. Mrs. Kargar has majored M.Sc in computer engineering and has a five-year-old daughter. Mr. Abdolaziz Azimi Ghadim, Turk clergyman and civil rights activist, has been arrested on 7 January 2017 in Tehran. According to AHRAZ (Association for the Human Rights of the Azerbaijani people in Iran), he has been transferred to the ward 209 in Evin prison for interrogation. He is kept in Evin prison so far and his family just one time after 61 days has been allowed to meet him. The accusations Mr. Azimi Ghadim was arrested for are not still known. It however seems that the arrest has been in connection with his activities on Telegram (the social network popular in Iran) channel with the name of “Rationality, analysis and action” which was mainly about civil rights of Turk people in Iran. While arrest, Mr. Azimi Ghadim was as guest in Mr. Ali Bagheri’s home who was also arrested and transferred to Evin prison. He has been released on bail of 200 million IRR after almost two months. The interrogating agent: East Azerbaijan Intelligence Unit of the Iranian Revolutionary Guardian Corps (IRGC). The past record: 4.5 years spent in Evin prison, has been on hunger strike several times. Note: 65 days on hunger strike that caused his temporary release. However, he was later transferred by the Iranian Revolutionary Guardian Corps (IRGC) to Tabriz Prison for continuation of his imprisonment. Accusation: assembly and collusion against security of regime and disturbance of public opinion. The reason for arrest: administration of an organization and news agency called “Independent Activist Wing”. The interrogating agent: Tabriz City Intelligence of the Iranian Revolutionary Guardian Corps (IRGC). Note: Amnesty International made statement about their unfair trial, pointing out tortures.